I have had the pleasure of watching Tony Galle teach middle school students communicate what they are imagining or would like to invent using 3D modeling software for over 10 years. I would watch fifth graders become fluent in Sketchup in just a few class sessions with Tony (back when my desk happened to be in the back of his classroom) . What happened next was magical. After just a couple strategically chosen tutorial style lessons, Tony would provide a prompt or two that had them using their new fluency with 3D modeling to communicate ideas that were in their head that blew us all away. 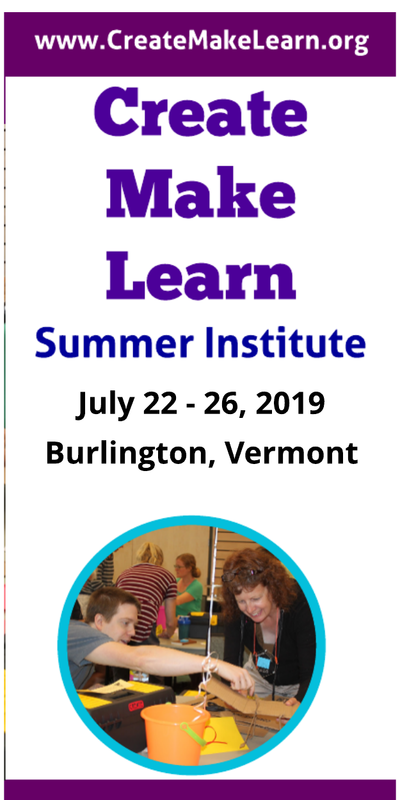 I've also seen him perform the same magic with teachers -- which is why I invited him to help teachers learn 3D printing at the 3D printing bootcamp at the Create Make Learn Summer Institute this summer. 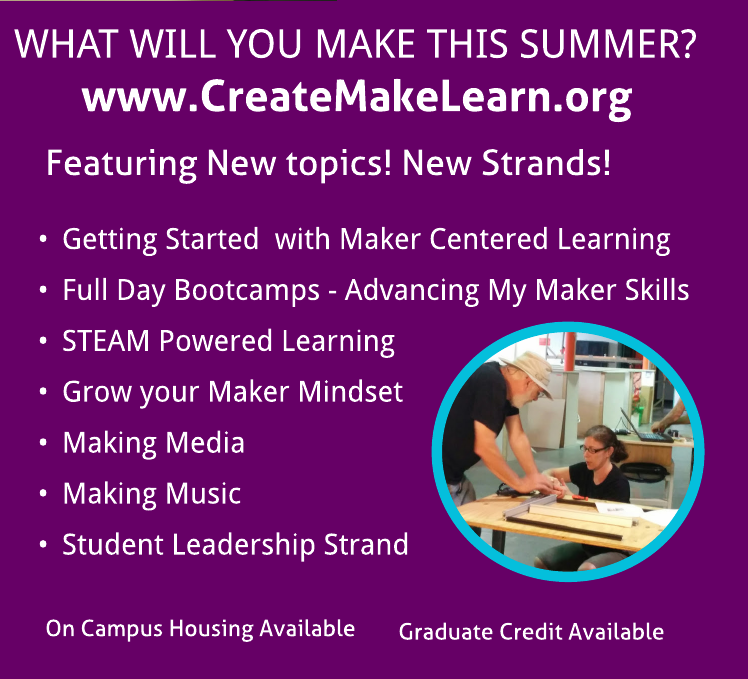 And not only is he willing to come share his magic at the Create Make Learn Summer Institute during the 3D printing bootcamp, he also offered to share his tips during our March is for Making series as a guest blogger. Here are Tony’s tips on how he teaches 3D modeling/ printing on a Chromebook. Middle school students at St. Albans Town Educational Center (SATEC) in northern Vermont spent some time learning how to 3D model. The students began their experience with Tinkercad, a free, cloud-based modeling tool that works right in your browser (which is handy in a 1:1 Chromebook school). Students can link their GAFE accounts and sign-up for free. This software features an easy-to-use interface and a number of practice lessons that teach kids how to work with the tool. 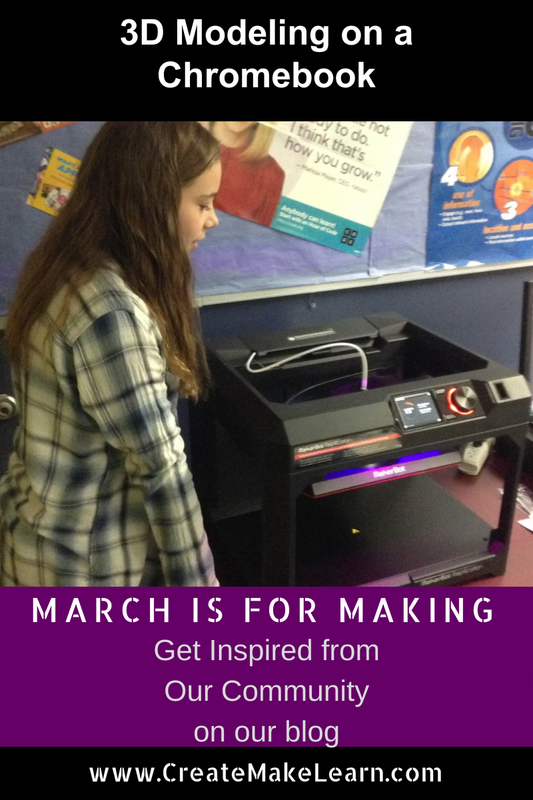 With almost no learning curve, kids are introduced to solid modeling. Using Tinkercad is like manipulating digital lumps of clay. There are many premade assets (called primitives in other software), including geometric and organic shapes. There’s even a text tool for rendering words and symbols as 3D models. Students typically build a name tag as their first project. It introduces them to the interface, and gives them a quick “win” when it comes to having something printable in the end. If engineered correctly, anything you model in Tinkercad can be exported and 3D printed. This year, a few kids took the skills they learned from the intro project, and asked if they could 3D print artifacts to use as part of a response to literacy project. 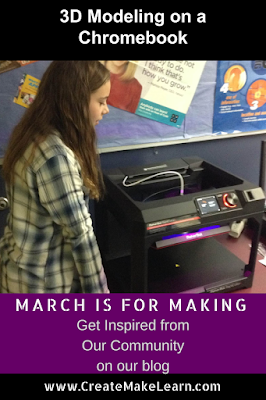 They modeled the items in Tinkercad, and then learned how to export and print them using our Makerbot Replicator +. Once students learn the basics of modeling, the next tool I teach is SketchUp. The full offline version of the software works on Macs and PCs, and, thanks to the State of Vermont, all students and teachers can have access to the full pro version with a license. In contrast, SketchUp for Schools is available as a cloud-based modeler (a good Chromebook alternative) as well, and can be connected to your school Google accounts, just like Tinkercad. SketchUp is similar to Autocad, where it’s a drafting program at the core, not a solid modeler . Students can draw their models as lines and shapes in a two dimensional plane, and then extrude them (Push/Pull) into the third dimension. They can add or subtract geometry by adding cut lines and extruding or extracting by push or pulling the faces of the model. Organic shapes are harder to manipulate, but not impossible. But, what it lacks as a sculpting tool, it more than makes up for in precision. If you want a cube that’s 1” square aligned to the center of a cylinder, you can do this in SketchUp. Such a task is much more difficult in Tinkercad, because you are doing it all by eye. SketchUp is an excellent tool for rendering architectural models, and a handful of SATEC students are using it to participate in the 3D Vermont: Town History in 3D Competition hosted by the Vermont Agency of Education. You can make precision measurements, and draw to the actual dimensions of a door, window, or stairway. The most exciting part of this whole adventure, has been when students come back after learning a certain tool, or working on a specific project and ask if they can make something for a different class. 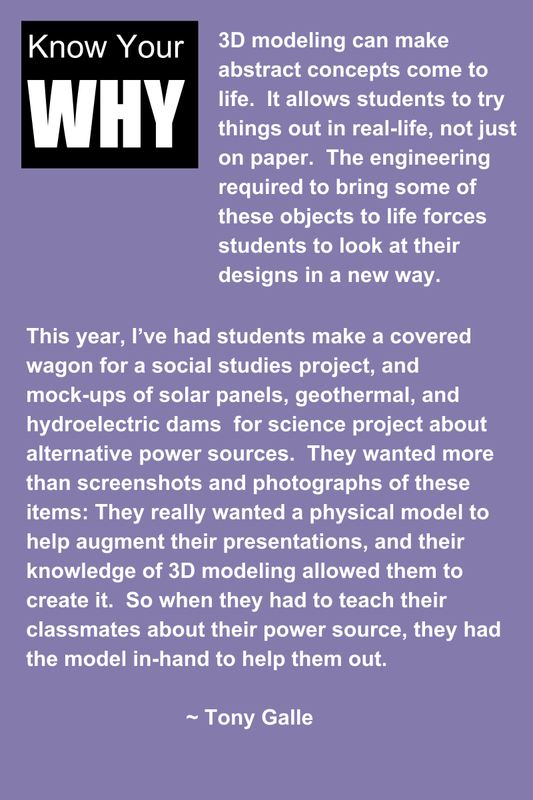 This year, I’ve had students make a covered wagon for a social studies project, and mock-ups of solar panels, geothermal, and hydroelectric dams for science project about alternative power sources. They wanted more than screenshots and photographs of these items: They really wanted a physical model to help augment their presentations, and their knowledge of 3D modeling allowed them to create it. 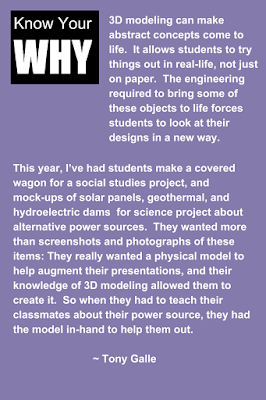 So when they had to teach their classmates about their power source, they had the model in-hand to help them out. 3D modeling using these free tools can make abstract concepts come to life. It allows students to try things out in real-life, not just on paper. The engineering required to bring some of these objects to life forces students to look at their designs in a new way, and there’s value in struggling to make these things. Thank you Tony Galle for sharing the following challenges to anyone interested in learning or teaching Tinkercad or SketchUp on a Chromebook.